Talking to a snowman? What could be a better winter activity? 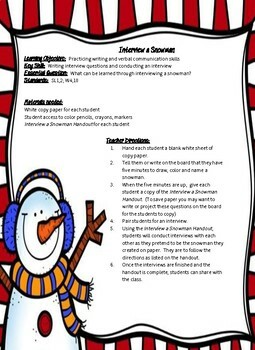 With this fun writing activity, students will draw their own snowman, then interview him (or her). Questions are provided and the imagination gets opened while using good writing skills with this assignment. Use it as an extended time activity or count it as one of the many writing opportunities for your students. Either way... who wouldn't want to interview a snowman?